Omni shipping containers are damage resistant and reusable many times. Interchangeable custom foam inserts makes Omni's cases flexible and safe multi purpose container systems. OmniCase will hit the road again in 2019 to exhibit and sell its products with the latest innovations in transport case technologies. Current and potential customers are free to inspect and order cases directly from the manufacturer. See lines of Omni Signature Cases at the following events. 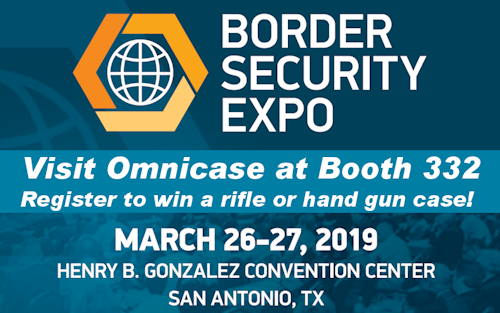 OmniCase will display cutting-edge cases designed for security, law enforcement, investigative and SWAT professionals for use in their daily work and routines..
DON'T MISS the opportunity to win a rifle or hand gun case! Just drop by the booth and register for the drawing that will take place at 2:00 P.M. on March 27. The Booth 332 opens at 11:00 a.m. on the 26th and 10:00 a.m. on the 27th. See you there! Keep your mission-critical tools organized! 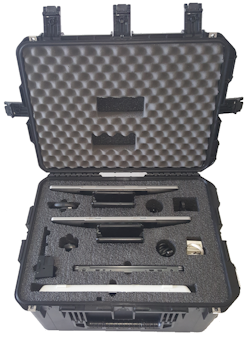 Omni's Investigation Kits are a must-have for professionals in the field. 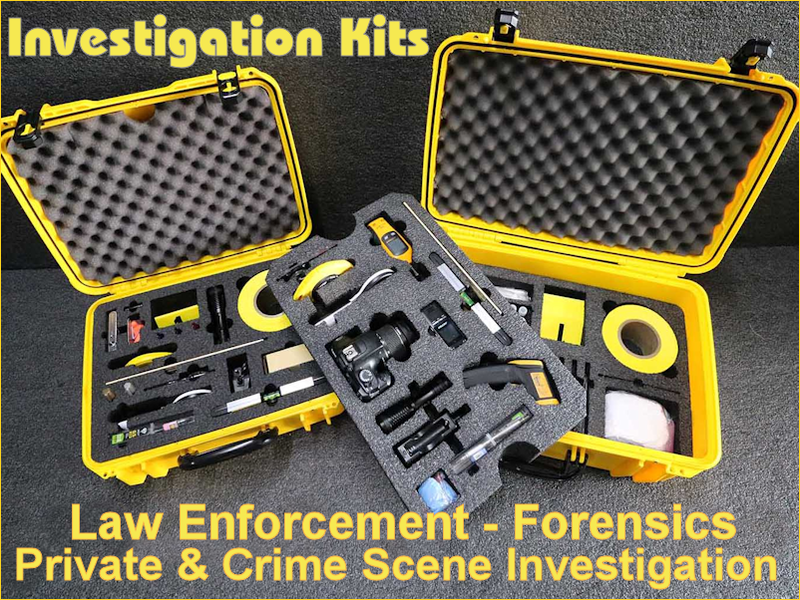 These kits are used by private detectives, crime scene investigators. law enforcement officers at accident sites and much more. Items such as barricase tape, cameras, chalk, cellular and digital test equipment are examples of kit contents. The kits were conceived and designed by ex-police officers who realized the need for a "kit in a case" that could be be used for multiple investigative purposes. Call for pricing and details for custom inserts. Make your brand visible and on the cutting edge of technology! OmniCase laser engraving boosts your products and brand recognition. Adding logos adds that uber-professional look. Include messages, product name, model and support numbers on your goods. 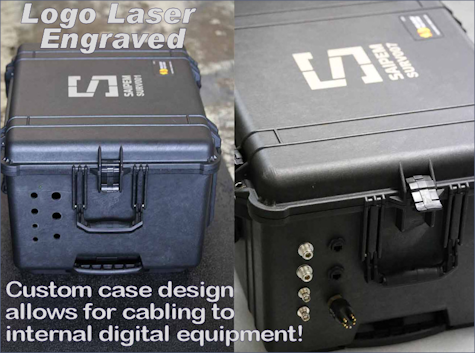 Laser marking is an invaluable asset for your product, electronics, shipping containers,road warrior and sporting gear, guns and rifles, tools and service kits, just to name a few possibilities. 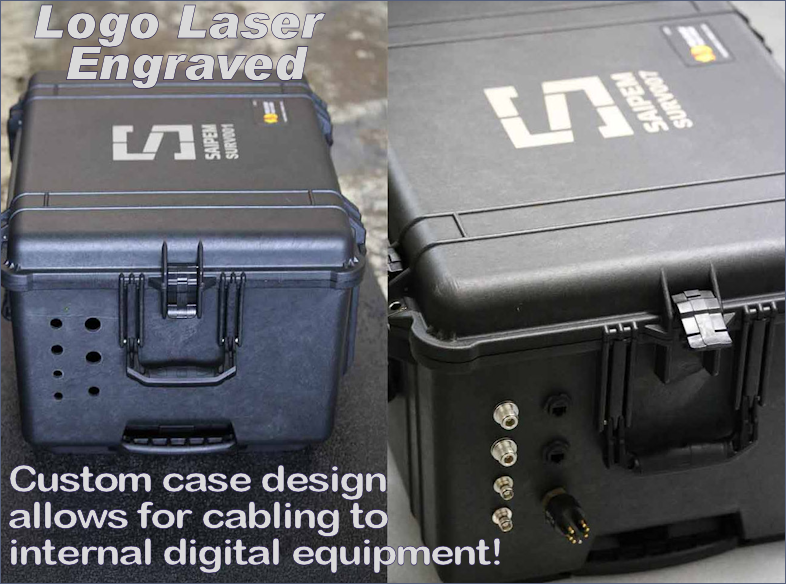 Click the image on the right for a close up view of the custom logo and cabling connectors designed by OmniCase! OmniCase is widely recognized for its PerfectFit™ line of signature custom-fitted protective foam case interiors that are designed, manufactured and assembled in Omni's Houston facility. The precision fitted case inserts are fashioned from PE foam, offering exceptional protection to delicate and costly instruments and cargo. 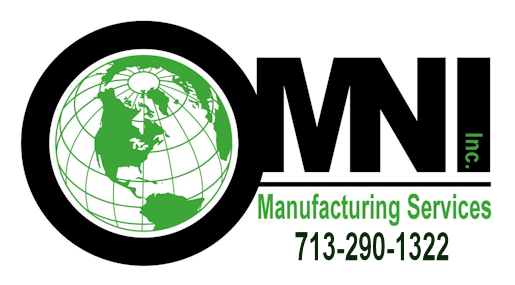 Highly functional equipment transport and packaging solutions are commonplace at OmniCase. Omni's cases are valuable assets and investments to safeguard valuables against damage for transport and storage scenarios. Combine your case purchases with Omni's custom, precision fitted foam case inserts, and you walk away with the best possible protection for your valuables. Call OmniCase now at 713-290-1322 to get started and get expert advise, guidance and help! Drones have come to the forefront in business, security and leisure activities. Omni designs and builds cases to protect expensive drones from damage during travel or shipping transport. 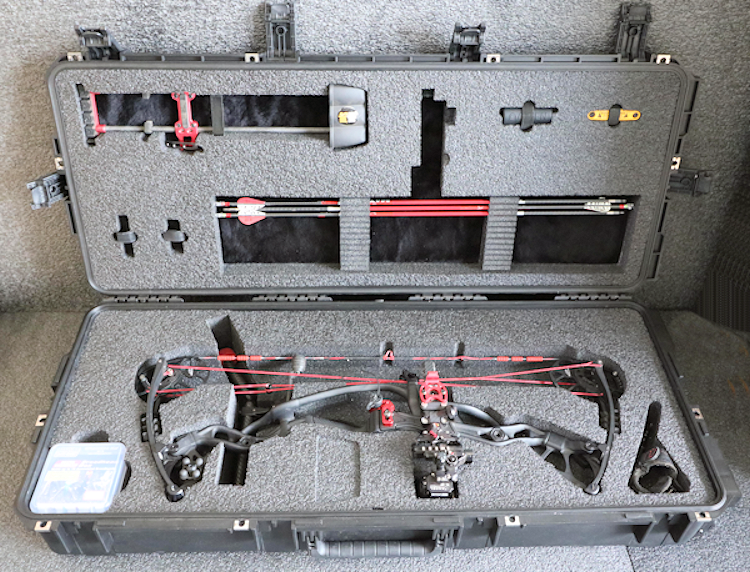 Professionals, enthusiasts and drone hobbyists come to OmniCase for custom-fitted cases. 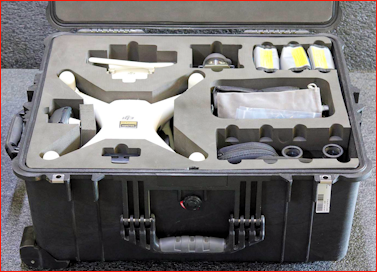 The drone case pictures to the left illustrates the snug fit for the machinery and additional pockets in which to store accessories. Call OmniCase for details on how to get started. The custom travel kit pictured below sports pockets to hold everything the modern road warrior needs, all in one neat protective hard-side case. This model has slots for two monitors and one laptop, as well as keyboard, mouse and additional accessories. OmniCase will customize your case to be a perfect fit for your gear. Don't leave home without it! OmniCase holds Master Distributorships for SKB and Flambeau Cases. Omni is also a distributor and value added reseller for Pelican Cases, Hardigg and most other leading case manufacturers. This diversity enables Omni to offer you the widest range of possibilities in regards to case sizes, duty purposes and configurations. Omni has the case to meet your containment specifications and requirements. Combined with our custom-fitted inserts, these cases become valued personal and business assets. 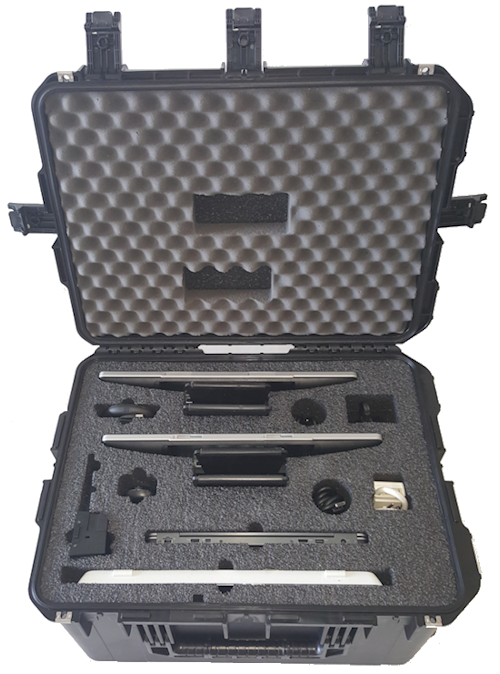 All types of protective and water tight cases for shipping and transport are available from the OmniCase warehouse. When you need specially outfitted and wheeled cases for mobile and traveling salesmen, tradesmen, medical appliances, EMS, paramedics, and point of sale, think Omni. Omni can supply you with a variety of compartmentalized cases and storage systems. Ask about biodegradable units. * Most cases manufactured by SKB include a lifetime guarantee. Omni price quotes document the lifetime guarantees for qualifying cases. Be sure you understand terms and guarantee period before purchasing an SKB case. Custom foam inserts and partitions do not carry lifetime guarantees. Have your logo and advertisement etched into Omni's top quality stainless steel tumblers. Large quantities of laser engraved tumblers available - NOW! 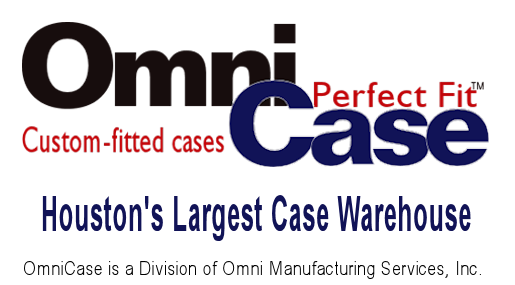 Omni inventories an impressive array of hard-side cases from leading case manufacturers. 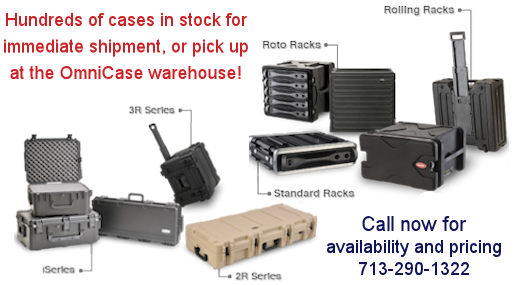 Literally hundreds of cases in all shapes and sizes are in stock ready to pick up at Houston's largest case warehouse. All popular shipping options are available for call-in purchases. Visit the warehouse at 2441 McAllister to see a large selection of famous-maker cases. 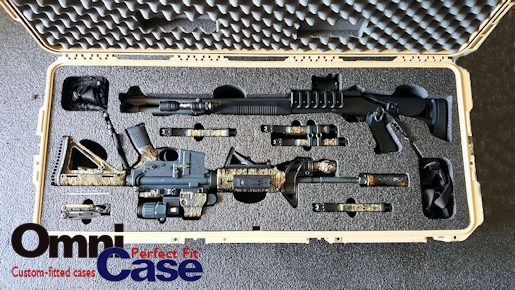 From small single handgun cases, to 95" x 28" x 28" monster cases.